Cars and fuel are expensive and take a large amount of your money. Safe facilities allow you and those you love to walk more and spend less on transportation. That means you will have more money to save or spend on other things. International Walk, Bike or Roll to School in the USA! But, we here at Walk Bike Berks know that you have lots of places to go -- including school -- so we are encouraging you to just get out and walk in October. We'll be posting special announcements in the coming days -- so check back with us often. In the meantime, send us a message and tell us where you are walking in October. Maybe we'll join you! BUNCO for Bicycles! is the very first members (and friends) party where we can all come together and celebrate the accomplishments of our first two years of building bicycle and pedestrian friendly communities. Volunteers have worked behind the scenes promoting safety and access throughout your neighborhoods all over our beautiful county -- and we want to meet you. Come, party, play, eat and win prizes on Thursday, September 24. Bring your friends -- and grow the movement to build Livable Streets throughout Berks! PS You can buy your BUNCO for Bicycles! ticket online right now -- click here! A PARTY -- YOU ARE INVITED! A Party for You -- This Thursday! Click Here to buy your ticket -- and receive FREE MEMBERSHIP FOR ONE YEAR! We did not fare as well as we should have and this is a good opportunity for us to follow up, be heard, build more positive relationships, and let them know we are watching. Senate Amendment 2371 would have allowed states to ‘opt out’ of spending 10% of their Surface Transportation Program Funds. This amendment failed in a 39-59 vote in the Senate this morning. Senator Coburn withdrew S. amendment 2370. Had this amendment passed, it would have decimated federal funding for bicycle and pedestrian facilities. The Transportation Enhancements program has provided between one half and three-quarters of all Federal funding invested in bicycling and walking improvements in the last 20 years. More than $250 million is at stake in fiscal year 2010 – if Coburn’s amendment had been successful it would have affect hundreds of trail projects, sidewalks, bicyclist education programs, bike rack on bus programs, and roadway improvements for bicyclists. PLEASE FOLLOW UP WITH YOUR SENATORS OFFICE NOW. Thank you for voting against Senate Amendment 2371 on the Transportation, Housing and Urban Development Appropriations bill. The amendment would have allowed states to opt out of the Transportation Enhancements program, which is the main source of funding for bicycle and pedestrian projects. Bicycling and Walking are clean and efficient modes of transportation. Currently, bicycling and walking account for 10% of the national mode share and yet receive less than 2% of the surface transportation funding. These cost efficient programs save 1.4 billion gallons of gas a year and 12 million tons of carbon dioxide emissions a year. At a time when we are looking to address climate change and reduce Green House Gas Emission’s (GHG) we should not be cutting funding for biking and walking. Bicycle and Pedestrian Infrastructure saves lives. Nationally, 13% of all roadway fatalities involve bicyclists or pedestrians. 41% of pedestrian fatalities occur where crosswalks are not available. Additionally, a recent survey conducted by AARP, shows that 47% of the nation’s elderly currently do not feel safe crossing the streets in their neighborhoods.Building Bicycling and Pedestrian facilities are good for the economy. Building biking and walking infrastructure creates jobs – bike infrastructure is more labor intensive and less material intensive than building roads. Sidewalks and bike lanes make streets and downtowns into destinations for shopping and entertainment. Investing in walking and biking facilities helps local business and is an investment in the local economy. Thank you again for your support of the Transportation Enhancement program and voting against Senate Amendment 2371. Bicycle and Pedestrian Infrastructure saves lives. Nationally, 13% of all roadway fatalities involve bicyclists or pedestrians. 41% of pedestrian fatalities occur where crosswalks are not available. Additionally, a recent survey conducted by AARP, shows that 47% of the nation’s elderly currently do not feel safe crossing the streets in their neighborhoods. Building Bicycling and Pedestrian facilities are good for the economy. Building biking and walking infrastructure creates jobs – bike infrastructure is more labor intensive and less material intensive than building roads. Sidewalks and bike lanes make streets and downtowns into destinations for shopping and entertainment. Investing in walking and biking facilities helps local business and is an investment in the local economy. PROTECT Transportation Enhancements -- TODAY! · Trails and multi-use paths – some of which build safer access for children and their families to walk and bike to schools and parks so that they do not need to cross busy four-lane highways. These and other Transportation Enhancement funded projects are at risk today in the US Senate. Projects that build community, increase safety, protect children, and provide us a high quality of living – those are at risk if Senator Coburn and Senator McCain are successful today. Please speak to our senators on our behalf – and demand that they not only continue to support existing Transportation Enhancement funding, but increase those dollars so that every American has equal access to travel freely, safely, and independently in their own communities. Visit The League of American Bicyclists at http://capwiz.com/lab/callalert/index.tt?alertid=14032801 . They provide phone numbers for your Senators as well as talking points. Please help join us in sounding the alarms and taking action this morning! Your voice is urgently needed. The U.S. Senate is scheduled to vote on eliminating walking and biking funds tomorrow, September 16. About an hour ago, we received word that Senators Tom Coburn (Okla.) and John McCain (Ariz.) just issued amendments to the FY10 Transportation, Housing and Urban Development appropriations bill. Their changes specifically attack funding for rail-trails, bicycling and walking. Please take a minute right now to call your senator and ask him or her to vote against Amendments 2370 and 2371 to H.R. 3288. Amendment 2370 would prohibit the use of federal funds for pedestrian or bicycle facilities, efforts to reduce vehicle collisions with wildlife, or other specified Transportation Enhancement (TE) projects if the Highway Trust Fund cannot cover unfunded highway authorizations. Amendment 2371 would allow states to eliminate spending on TE, the nation’s largest funding source for trails, walking and bicycling. Congress currently sets aside a portion of federal funds for TE to support these projects in all states. This is truly an all-hands-on-deck moments. Please act now—call your senator and ask him or her to vote against the proposed amendments. 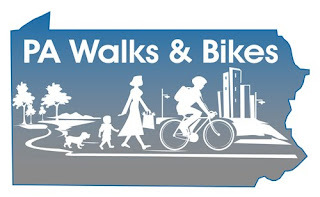 Pennsylvania has a new state-wide Walk and Bike Organization! Click on the new logo to visit the Livable Streets page and learn more today. The Safe Routes to School National Partnership has launched a “Dear Congress: Why Safe Routes to School is Important” campaign. The Partnership needs your help generating hundreds—if not thousands—of letters from children, parents, program staff and volunteers, and school and city leaders talking about why Safe Routes to School matters to individuals and communities. The Partnership will bundle your letters and share them with members of the House and Senate so that they know how many people in their states and districts value Safe Routes to School. http://www.saferoutespartnership.org/national/299443 and look for the link on the homepage. The deadline for the campaign is September 24,2009. Rails-to-Trails Conservancy's (RTC) Northeast Regional Office is conducting interactive user surveys for rail-trails throughout Pennsylvania. The first completed survey was of the 64-mile Pine Creek Trail in north-central Pennsylvania. "Slightly more than 1,000 trail users responded to the survey over an eight-month period," says Carl Knoch, manager of trail development for the Northeast Regional Office. Feedback from these surveys provides important information on levels of rail-trail use and how much economic impact rail-trails can produce for local communities. Questions on the surveys include how many nights visitors stay in local accommodations during their trail visit, how much they spent on items like beverages, snacks, sandwiches, ice cream and meals, and where people travel from to use the trails. "One of the most surprising statistics we received was that respondents came from 57 of the 67 counties in the state," says Knoch. Trail managers use this data to understand the type and frequency of users their trail sees. Since the Pine Creek survey, funded by Pennsylvania Department of Conservation and Natural Resources, RTC has placed infrared counters in select areas. Though often unnoticed by trail visitors, these counters can greatly enhance user profile analysis. Following the Pine Creek survey, Knoch and Patricia Tomes, program coordinator for the Northeast Regional Office, are completing the analysis for the 19.5-mile Perkiomen Trail outside of Philadelphia. Also, this past fall Tomes placed two dozen survey boxes on the Schuylkill River Trail. The surveys will be available for an entire year. Tomes says the next survey project will be held this spring on the Ghost Town Trail in Indiana County. The vast majority of trail managers don't have the ability or funding to conduct surveys or measure user counts. So when trail managers are able to utilize these resources RTC provides, their leverage in seeking more maintenance and operation funding grows exponentially—not to mention their case for extending their trail or building others. RTC is currently talking with other states about the possibilities of expanding this initiative. In the meantime, if you are visiting a rail-trail in Pennsylvania, be sure to look out for a survey to share your voice. In an Aug. 18th Boston Globe article, Mark Rosenberg wrote "Three years ago, I was driving in Atlanta early one morning when I saw a body on the road. It was a young female runner. I called 911 and then ran to her. She had a horrendous head injury but still had a heart beat. I started CPR, but her injuries were too severe. She died in my hands. I wrote a column in the Atlanta Journal-Constitution about what happened to the runner, and a flood of letters came in. "Half blamed the runner, saying she should not have been running in the street at that hour. Half blamed the driver, for not paying close enough attention. Not a single writer blamed the road. I took a photograph of the scene where I had found the runner. When I showed this picture to friends from Sweden they asked, 'This is where you live? This is your neighborhood? Your streets are designed to kill people.'..." Title: "Roads that are designed to kill"
~From CenterLines, the e-newsletter of the National Center for Bicycling & Walking.